After coming up with a set of design requirements and what all I learned from using the Pioneer for a few years, it was time to start making it all a reality. 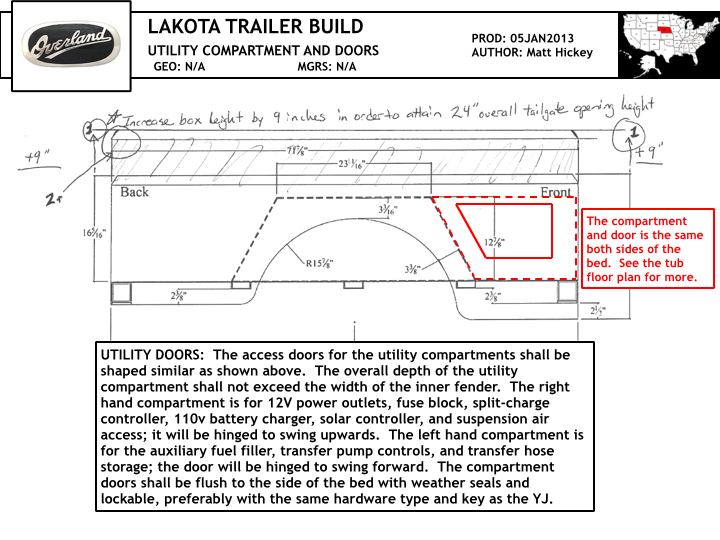 The Lakota is in many ways going to be at the opposite end of the spectrum of an overland trailer build for me. The reason being that the Pioneer was an experiment on using an overland trailer with a Jeep for long distances over technical terrain; therefore the design and build was rather minimal and economical. 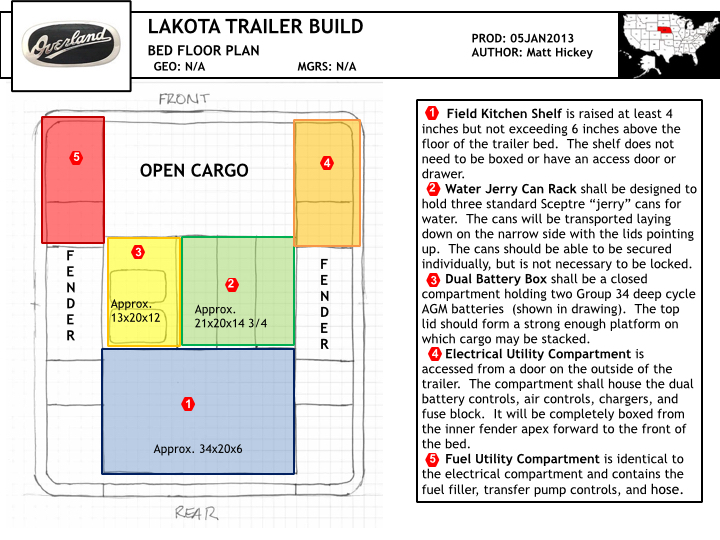 The Lakota is to be much more complex, use high quality materials throughout, and be fitted with much more equipment. In order to finalize the design enough to begin purchasing components, I needed to settle on the body dimensions. In effect, I had to figure out what body I was going to utilize, or go completely from scratch. The research I did was extensive. 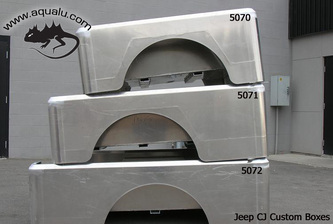 I looked into doing a custom cut and fabrication of junkyard Wrangler body tubs, purchasing replacement tub corners and panels to build a custom tub, fiberglass tubs and kits, completely hand fabricated bed body, an AEV Brute bed, and custom aluminum tubs. After much notebook scribbling and cost analysis, I decided to go with a custom Jeep style aluminum pickup bed manufactured by Aqualu Industries, Inc. in British Columbia. 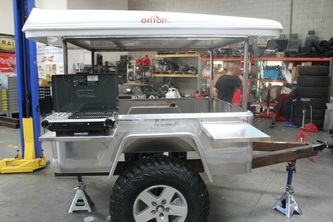 They produce replacement bodies for several short wheelbase 4x4s out of marine grade aluminum. They also do some custom bodies and these pickup beds for people wanting to do some amazing Jeep conversions. They were more than happy to make some custom design changes and get the bed built and shipped for me. I was very pleased with how accommodating the people at Aqualu were. Especially since I was in Afghanistan and was doing everything very long distance. 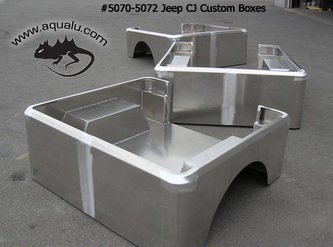 Aqualu ended up producing what they call the #5072 Jeep CJ Custom Box for me. They were kind enough to add an extra 9" to to the top of the box. This extra height will allow for fully enclosing the bed with my field kitchen, "The KBOXXX", inside. Obviously, the increased interior size allows for more gear to be kept out of the weather. 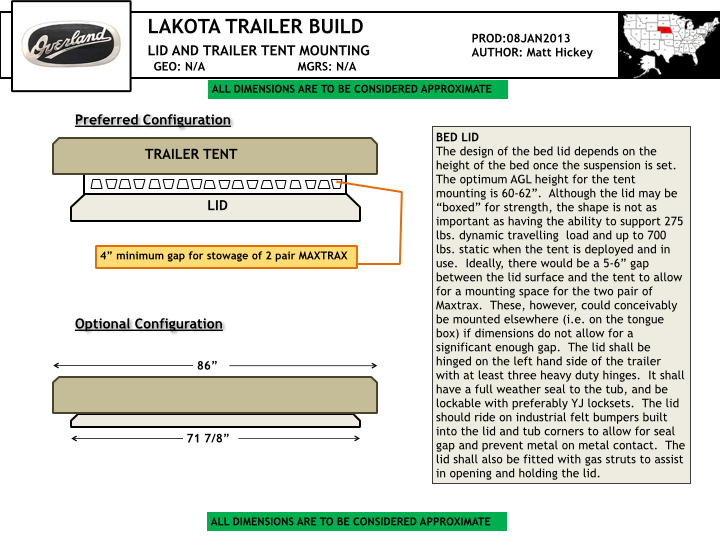 I also estimated that this would put me into the overall target height zone for the trailer tent (more on that later). 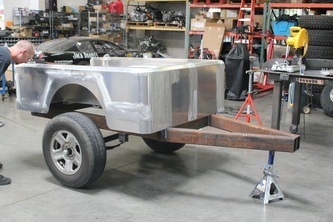 Aqualu uses 5/32" thick marine grade aluminum alloy for fabricating these beds and bodies. The result is both lightweight and quite strong. The #5072 body is only 176 lbs.! There are several styles of these beds that Aqualu produces. I believed that the #5072 would be the best fit for my project due to the length and fender placement for the axle and pivot wheelbase. See the gallery below for Aqualu's photos of the original #5072 bed. Now that I knew the bed dimensions, I could begin finalizing the frame and body design. This required a lot of notebook time, but I finally had a solid plan to work from. The critical dimension for the frame would be the tongue length. The track width wouldn't be an issue since I was using a reproduction Jeep bed that followed factory dimensions. 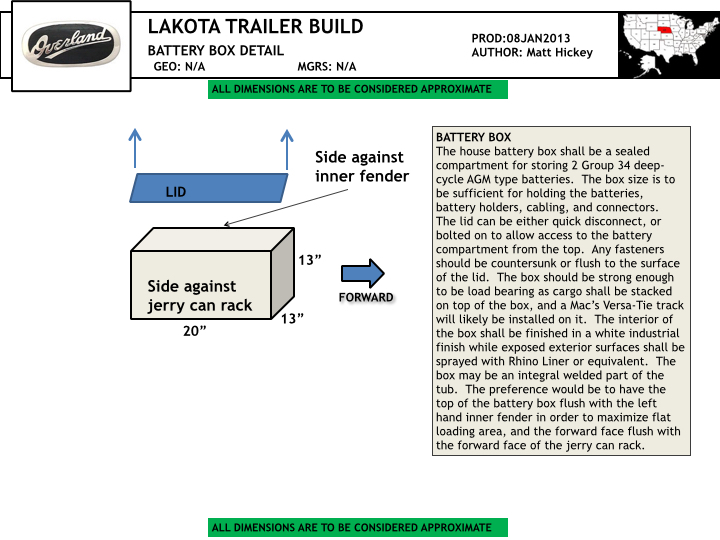 The axle was fairly centered on the bed, and the addition of the tongue box should balance the design. The suspension should also be mounted very similarly to the tow vehicle and result in a very close roll center. 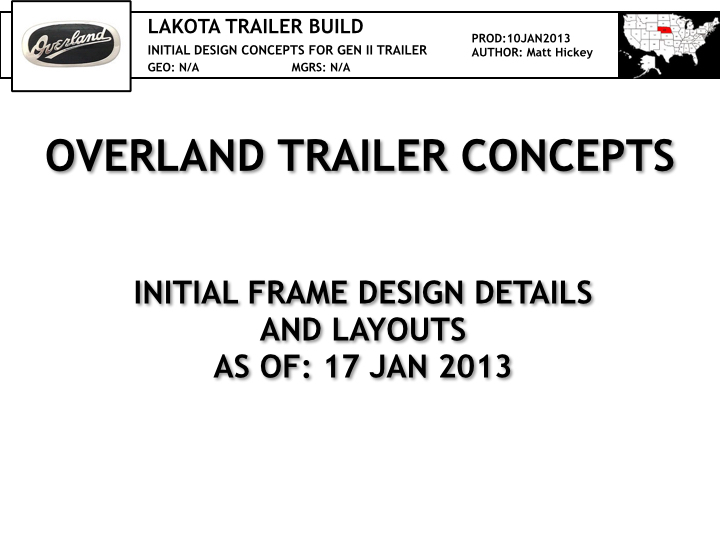 Below are some of the original design slides I produced for the Lakota. Although the frame and body layout all happened simultaneously, the frame setup is obviously the most important. Now it was time to make sure I had the space to fulfill all of my design criteria that were to go into the trailer. Not only was the KBOXXX to fit inside the enclosed trailer bed, I planned to store water, mount a dual battery box, enclose the electrical controls, and enclose the fuel transfer hose and controls within the trailer body. There still needed to be room for my camping gear as well! The original design I came up with is below. 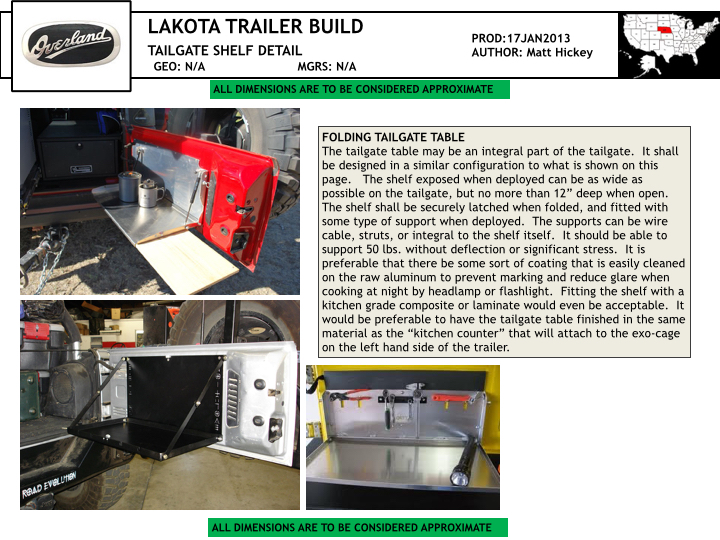 Finally, I needed to take into consideration how all the gear would be mounted and stored in and on the trailer to give me the functionality I learned that I needed. This was the most nerve-wracking part of the design process since I was still unclear as to how it all would actually fit. Many existing components had to be measured against the tub dimensions, and estimations made on others. Also, I had to figure out how everything might mount given what I learned building the Pioneer trailer and how this aluminum bed was designed. This is what I initially came up with. As you can see, there was already a significant amount of design work that has gone into the trailer, and the build really hasn't even started. So far, my long distance design process with Derek has been going well. 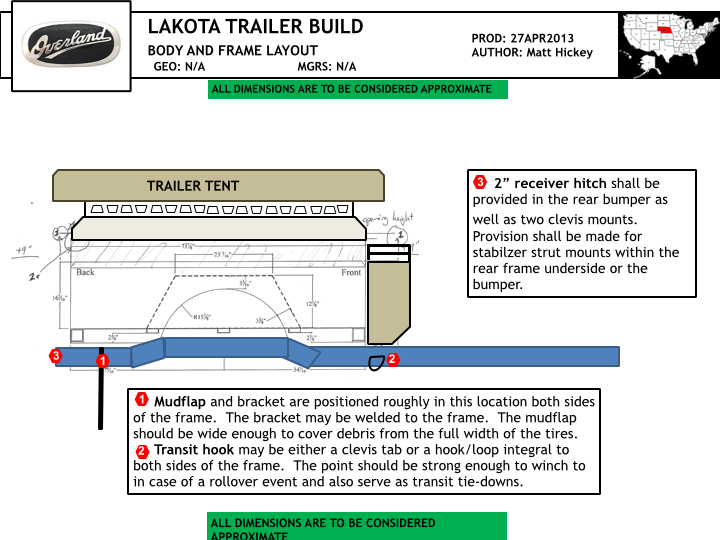 Next article, we will discuss the trailer tent decision and how it effected some design points.